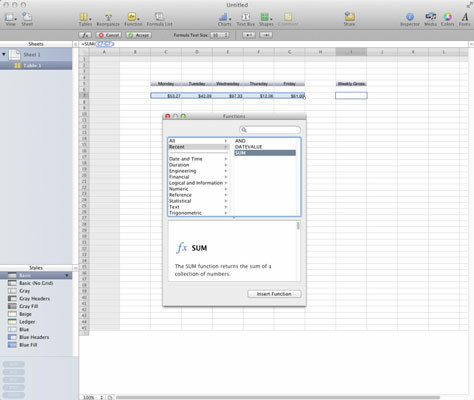 Sorry, but it’s time to talk about formulas for MacBook’s Numbers documents. While they seem complicated, these formulas can help make your life easier. These equations calculate values based on the contents of cells you specify in your spreadsheet. By the way, formulas in Numbers always start with an equal sign (=). So what’s the big deal? Why not use a calculator? Sure, but maybe you want to calculate your weekly salary. Rather than grab a pencil and paper, you can simply change the contents of cell B1 to 52, and — boom! — the spreadsheet is updated to display your weekly salary. That’s a simple example, of course, but it demonstrates the basis of using formulas (and the reason why spreadsheets are often used to predict trends and forecast budgets). A spreadsheet is the “what if?” tool of choice for everyone who works with numeric data. Select the cell that will hold the result of your calculation. Click the Formula box and type = (equal sign). The Formula box appears to the right of the Sheets heading, directly under the Button bar. Note that the Format bar changes to show a set of formula controls (a.k.a. the Formula bar). Click the Function Browser button, which bears the fx label. The Function Browser button appears next to the red Cancel button on the Formula bar. In the window that appears, click the desired formula and then click Insert Function to add the formula to the Formula box. Click one of the rounded argument buttons in the formula and click the cell that contains the corresponding data. Numbers automatically adds the cell you indicated to the formula. Repeat this for each argument in the formula. When you’re finished, click the Accept button to add the formula to the cell. That’s it! Your formula is now ready to work behind the scenes, doing math for you so that the correct numbers appear in the cell you specified. To display all the formulas that you’ve added to a sheet, click the Formula List button on the toolbar.